Considering that Saint Matthew is traditionally believed to have composed the Gospel that bears his name, surprisingly little is known about this important apostle and evangelist. He is mentioned only five times in the New Testament. Matthew 9:9 gives the account of his calling: "And when Jesus passed on from hence, he saw a man sitting in the custom house, named Matthew; and he said to him: Follow me.And he rose up and followed him." From this, we know that Saint Matthew was a tax collector. In St Mark’s Gospel and in St Luke’s Gospel however, the tax collector called by Jesus is named Levi. It is possible that Matthew cold have been the name that Christ gave Levi at his calling. Tax collectors were despised in the ancient world, especially among the Jews at the time of Christ, who saw the imposition of taxes as a mark of their occupation by the Romans. Thus, after his calling, when Saint Matthew gave a feast in Christ's honour, the guests were drawn from among his friends—including fellow tax collectors and sinners (Matthew 9:10-13). The Pharisees objected to Christ eating with such people, to which Christ responded, "I am not come to call the just, but sinners," summing up the Christian message of salvation. 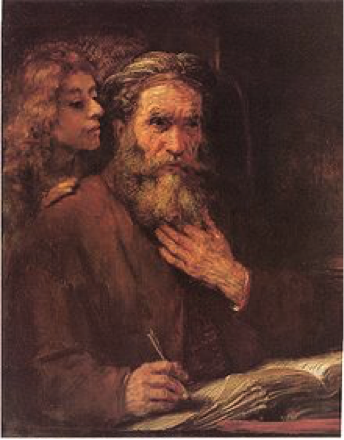 The remaining references to Saint Matthew in the New Testament are in lists of the apostles, in which he is placed either seventh (Luke 6:15, Mark 3:18) or eighth (Matthew 10:3, Acts 1:13). After Christ's Death, Resurrection, and Ascension, Saint Matthew is said to have preached the Gospel to the Hebrews for as many as 15 years, before heading east to continue his efforts at evangelization. By tradition, he, like all of the apostles with the exception of Saint John the Evangelist, was martyred, but accounts of his martyrdom varied widely. Traditionally Saint Matthew is shown with a money sack and account books, to signify his old life as a tax collector, and an angel above or behind him, to signify his new life as a messenger of Christ.